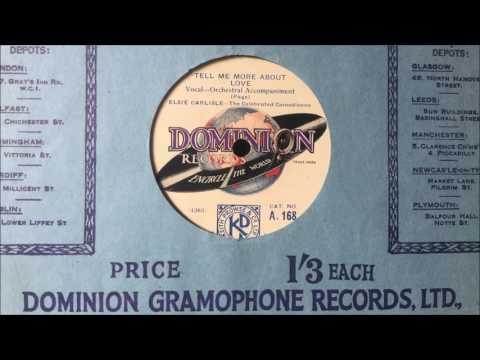 “Tell Me More About Love.” Words and music by Bert Page. Recorded by Elsie Carlisle, accompanied by Jay Wilbur and His Orchestra (uncredited) c. late June 1929. Dominion A. 168 mx. 1363-3. “Tell Me More About Love” is a woman’s account of her love-making technique. Her approach is to seem innocent and to want instruction in the ways of love; hence the repetition of the title line “Tell me more about love.” She represents herself as a sort of student (“I don’t know what to do — / I can learn lots from you…”; “Teach me all — please don’t wait…”). She is “bashful” and “shy,” and explains that “love has never come [her] way,” but then she lets it slip that the various “lines” that she is rehearsing are ones that she practices every night with a different boy! In retrospect, her earlier request to have the lights dimmed or even turned off should have given her away. 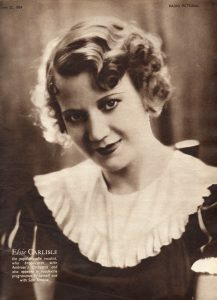 Elsie Carlisle’s perky and chatty delivery in “Tell Me More About Love” showcases her talent for dramatizing a song and making it somewhat conversational, in spite of the absence of an interlocutor. Here Elsie’s delivery sounds a bit like that of Helen Kane, minus, of course, the exaggerated Bronx accent. Elsie’s romantic whimper at the end of the song is particularly precious, rivaled only by the primal girlish giggle in “Wasn’t It Nice?” (recorded the next year). A light and upbeat piece of music, “Tell Me More About Love” contrasts nicely with Elsie’s decidedly plaintive rendition of “Mean to Me” on the flip side of the record. “Tell Me More About Love” was also recorded that year by Mabel Marks, the Arcadians Dance Orchestra (under the direction of Bert and John Firman), Florence Oldham (accompanied by Sid Bright on the piano and Len Fillis on the guitar — Oldham is sometimes portrayed on the sheet music), Kay and Kaye (a.k.a. Stanley Kirkby & Rita Bernard), and Billy Bartholomew, an English bandleader who recorded primarily in Germany from 1924-1938.